It is with a lifetime of happy memories and love, we release our mom to her new heavenly home. 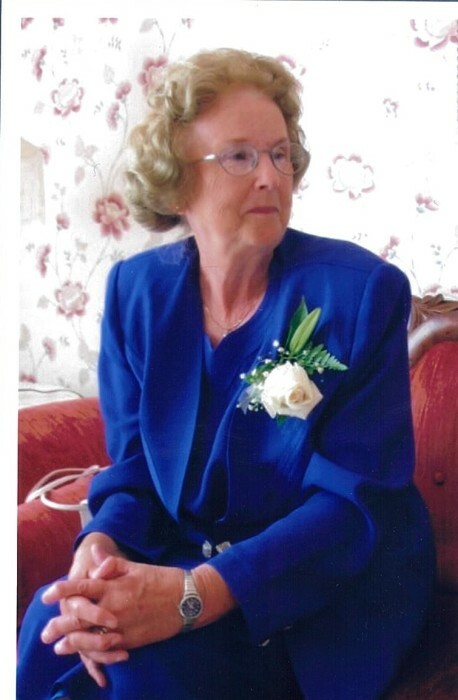 Frances Eileen (Sunderland) Belyea passed away peacefully at Shannex - Tucker Hall on Tuesday, February 5th, 2019, surrounded by her loving family. Born 1932, in Campbellton, NB, she was the daughter of the late Walter and Marguerite (Chamberlain) Sunderland. Mom’s greatest joy was spending time being the center of her family, taking care of everyone. She was the rock that held us all together and we shared so many happy parties, vacations and special events together. Her excellent cooking made everything seem so much better because of the love it contained. Eileen started her career at the D.V.A Hospital and then moved over to the Regional Hospital where she worked as a ward clerk for many years until her retirement. A quiet but dedicated woman of faith, she was a member of the First Wesleyan Church where she enjoyed many years of activities and good friends. Eileen is survived by her sons Paul (Charlene) of Hampton, Stephen (Jackie) of New River, John (Ellen) of Saint John; daughter Christine Crawford (Harold) of Saint John; sister Phyllis Boyle of Saint John; as well as many grandchildren, great grandchildren, nieces, nephews and friends. Besides her parents, Eileen was predeceased by her husband Norman, brother Lewis, sisters Dorothy, Marjorie and Janet and great granddaughter Khloe. Arrangements are under the direction of Fundy Funeral Home, 230 Westmorland Road (646-2424) with visitation being held on Thursday, February 7th from 2 to 4 and 6 to 8 p.m. A Celebration of Eileen’s Life will take place from the Fundy Funeral Home chapel on Friday, February 8th at 2:30 p.m. Interment will be held at Greenwood Cemetery in the spring. Donations in memory of Eileen may be made to the Heart & Stroke Foundation of New Brunswick, Gideon’s or to the charity of the donor’s choice.